At the macro level, remittances constitute an important source of external financing for many emerging market and developing economies. 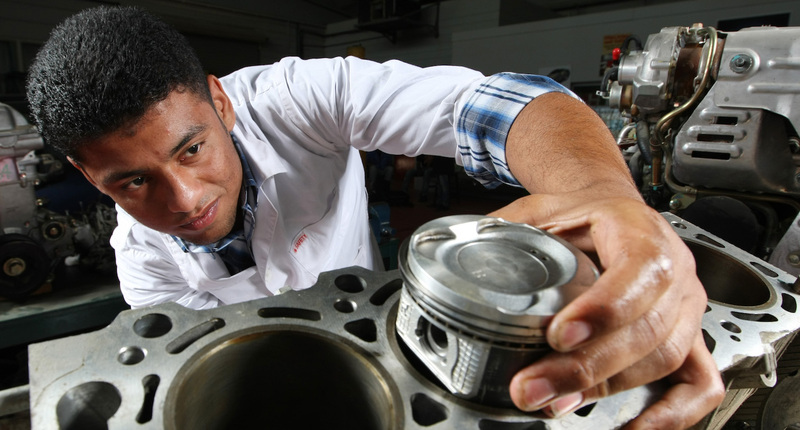 At the micro level, they can facilitate investments in health, education, or small businesses. A large literature has documented their beneficial effects on poverty, however, their effects on inequality are much less clear and would depend on which households across the income distribution are most likely to receive remittances and how much they receive. The empirical literature is inconclusive on the impact of remittances on inequality. While some studies found that migration and remittances increase inequality (e.g. Adams 2006, Adams et al. 2008, Barham and Boucher 1998, Bouoiyour and Miftah 2014, Möllers and Meyer 2014), others found that they reduce it (e.g. Acosta et al. 2006, Brown and Jimenez 2007, Gubert et al. 2010, Loritz 2008, Margolis et al. 2013, Mughal and Anwar 2012, Taylor et al. 2009), or have no significant effect (e.g. Beyene 2014, Yang and Martinez 2005). Changing effects over time could drive these conflicting findings. As highlighted by Stark et al. (1988) ‘pioneer’ migrants (who face higher costs of migration) may come from relatively richer households than later migrants, who benefit from falling costs of migration due to improved access to labour markets as migrant networks expand. Migration would thus first increase then decrease inequality in sending countries over time. In a recent paper (Koczan and Franz Loyola 2018), we investigate how remittances affect inequality in Mexico, and how this effect changes during economic crises. Specifically, we examine the behaviour of remittances before, during, and in the aftermath of a domestic crisis, the 1994 Mexican peso crisis, as well as the global financial crisis, which affected both the sender and receiver countries. Mexico has a long history of outmigration, in particular to the US, and most migrants send money home to support their families. In 2014 households in Mexico received on average about $290 per month ($140 median). 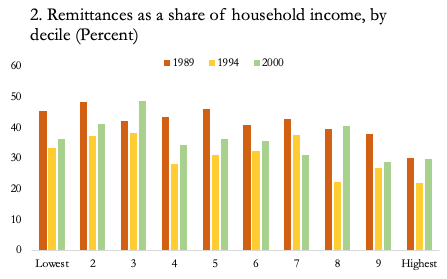 Figure 1 shows the share of households receiving remittances and the amount of remittances received as a share of household income by income decile. 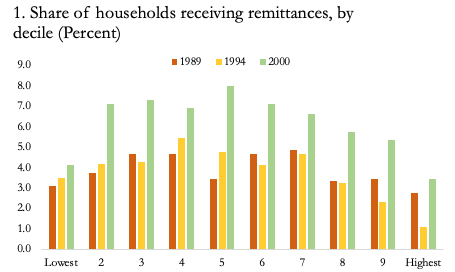 By the 2000s, as migration opportunities became more widespread, remittances became especially important for poorer households. Today these households are both more likely to receive remittances and remittances constitute a larger share of income for them. 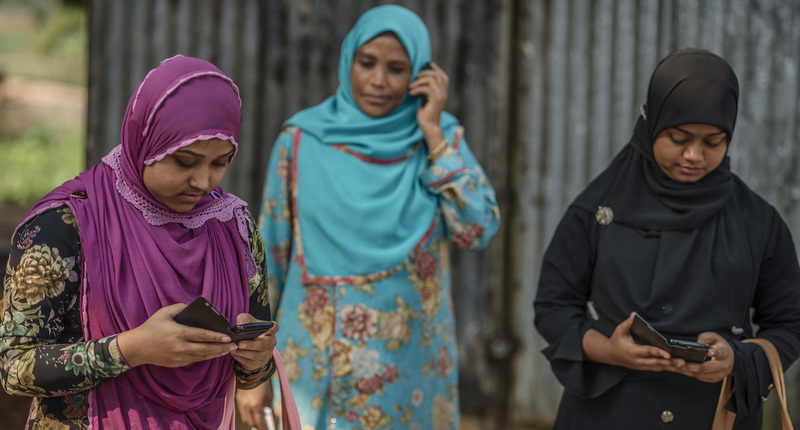 These households have, however, become less dependent on remittances over time, with remittances declining from 30–40% of household income in the 1990s to around 20–25% in 2014. Households in rural areas, as well as those with fewer employed or more elderly household members, are more likely to receive remittances. This is also the case for households with female household heads, likely reflecting a male migrant, and households where the household head is less educated. 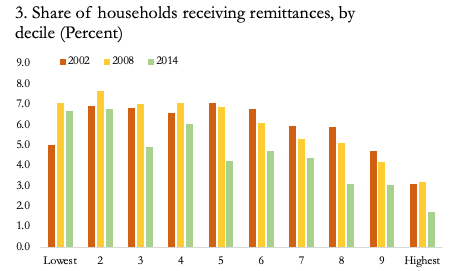 These patterns are broadly similar for poor as well as rich remittance-receiving households. What does this imply for inequality? based on income excluding remittances. This, however, is unlikely to be an accurate measure of the effect of remittances on inequality as households would likely increase hours or employment in the absence of remittances, though it is unclear up front how such responses would differ across the income distribution. 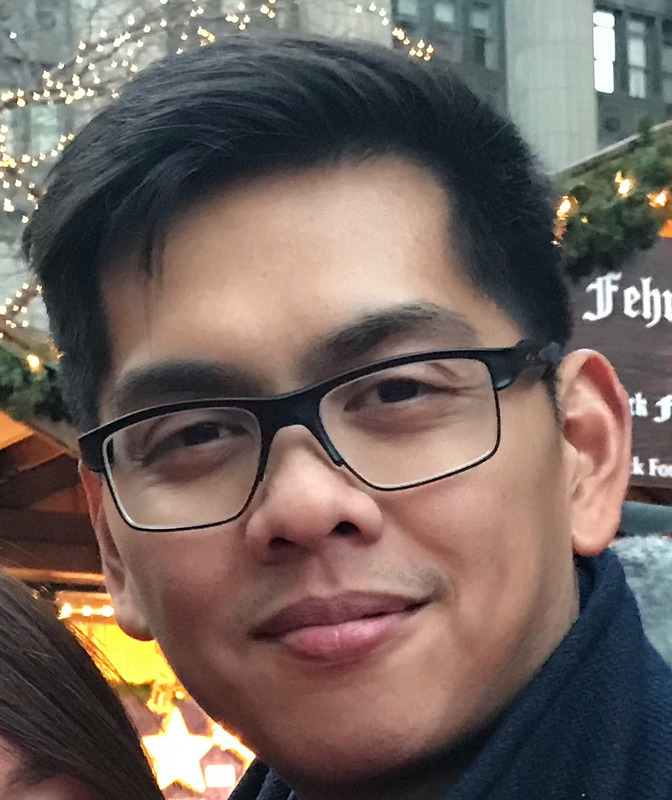 In order to estimate the effect of remittances on inequality more accurately, we thus first construct counterfactual incomes for remittance-receiving households using propensity score matching, providing an estimate of what their incomes would have been if they did not receive remittances from household members abroad. 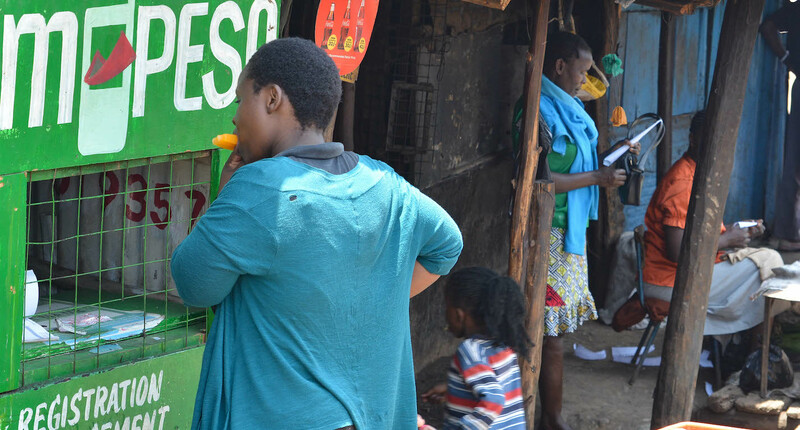 We do so by looking at what the incomes are of households who are similar to them in terms of composition (number of household members, children, elderly and employed), characteristics of the household head (age, gender, education) and whether the household is in an urban or rural location, but who do not receive remittances. We then use these incomes to build an entire counterfactual income distribution for Mexico, based on actual incomes for households who do not receive remittances, and these imputed incomes for households that do receive remittances. Source: INEGI and authors' calculations. Note: Counterfactual income uses actual income for non-remittance-receiving households and an estimated counterfactual income for remittance-receiving households based on propensity score matching. 'Earlier period' includes the surveys in 1989, 1994 and 2000; 'later period' includes the surveys in 2002, 2008 and 2014. This counterfactual income distribution is less unequal (measured using the Gini coefficient) than that based on incomes excluding remittances. However, it is still more unequal than the distribution of actual income. This suggests that remittances help make the distribution of income more equal - inequality would be higher in the absence of remittances, even when taking the behavioural response into account. What are the effects of the crises? Were households more likely to receive remittances or did they receive higher amounts during the years of the Peso crisis and Global Financial Crisis, relative to the years before and after? And how do these effects vary across the income distribution? Even when controlling for a range of household characteristics, there are very clear crisis effects. Figure 3 depicts how the likelihood of receiving remittances and the amount of remittances received as a share of income changed across income deciles during the Peso and global financial crisis, respectively. 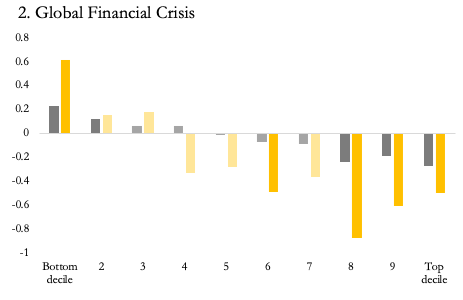 Both crises showed an increasingly pro-poor pattern of remittances. During the Peso crisis the likelihood of receiving remittances as well as amounts received as a share of income fell at the top, while there was little change in the lower income deciles. 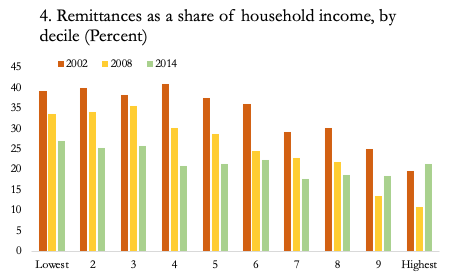 During the Global Financial Crisis, the likelihood of receiving remittances as well as remittance amounts as a share of income again fell at the top, but now even increased at the bottom. 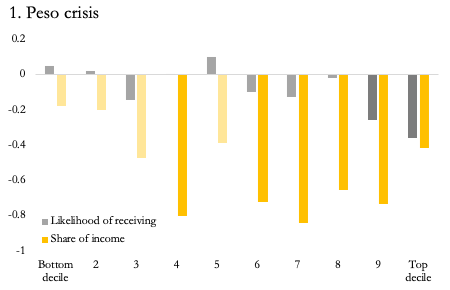 The decline in remittances to richer households during crises periods in the receiving country is consistent with falling investment motives. The increase in remittances to poorer households during the Global Financial Crisis could reflect both the more widespread migration opportunities in Mexico and/or migrants with a longer history of migration being better able to cushion the shock in the US. This insurance effect is quite striking in a context where both the sending and receiving countries were hit by a common shock. Note: The figure plots crisis year dummy coefficients (1994 in panel 1 and 2008 in panel 2) from regressions, which also control for characteristics of the household and the household head. Darker colours denote statistically significant coefficients at the 10% level. 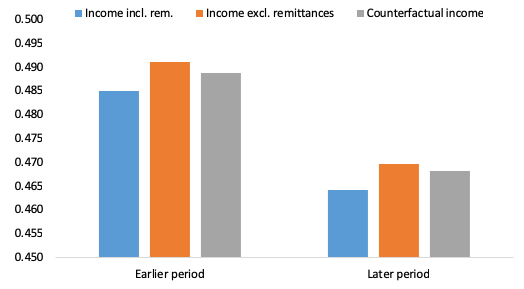 These results thus suggest that not only can remittances lower inequality at the macro level, they could also help mitigate shocks hitting the poorest. 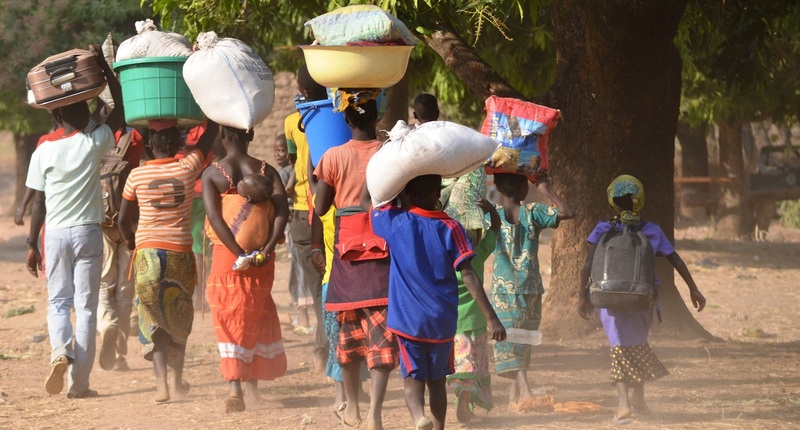 Their pro-poor pattern appears to have strengthened over time, consistent with migration opportunities becoming more widespread and migrants becoming better integrated in the host country. This has allowed remittances to cushion some of the shocks of the Global Financial Crisis, especially at the bottom of the distribution, despite migrant incomes likely being hit in the sending country as well. Editor’s Note: The views expressed in this column are those of the authors and should not be attributed to the IMF, its executive board, or its management. Acosta, P, C Calderon, P Fajnzylber and H Lopez (2008), “What is the impact of international remittances on poverty and inequality in Latin America?”, World Development 36(1): 89–114. Adams, R and H Alderman (1992), “Sources of inequality in rural Pakistan: A decomposition analysis”, Oxford Bulletin of Economics and Statistics 54(4):591–608. Adams, R (2006), “Remittances and poverty in Ghana”, World Bank Policy Research Working Paper 3838. 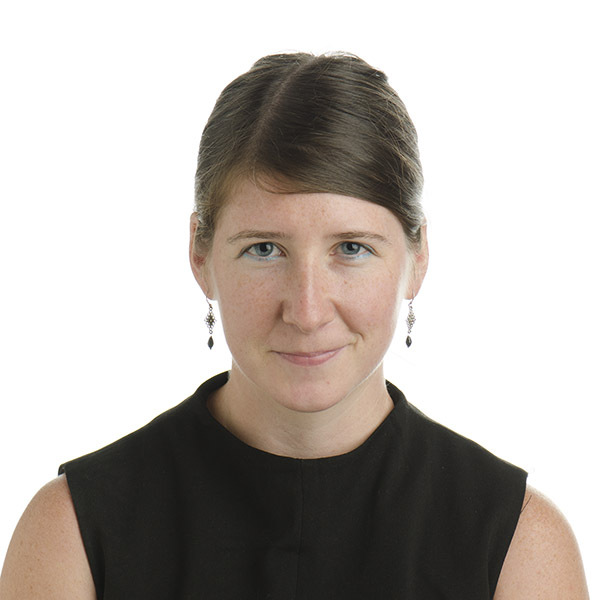 Adams, R, A Cuecuecha and J Page (2008), “The impact of remittances on poverty and inequality in Ghana”, World Bank Policy Research Working Paper 4732. Barham, B and S Boucher (1998), “Migration, remittances, and inequality: Estimating the net effects of migration on income distribution”, Journal of Development Economics 55: 307–31. Beyene, BM (2014), “The effects of international remittances on poverty and inequality in Ethiopia”, The Journal of Development Studies 50(10): 1380–96. Bouoiyour, J and A Miftah (2014), “The effects of remittances on poverty and inequality: Evidence from rural southern Morocco.” MPRA Paper 55686, Munich Personal RePEc Archive. 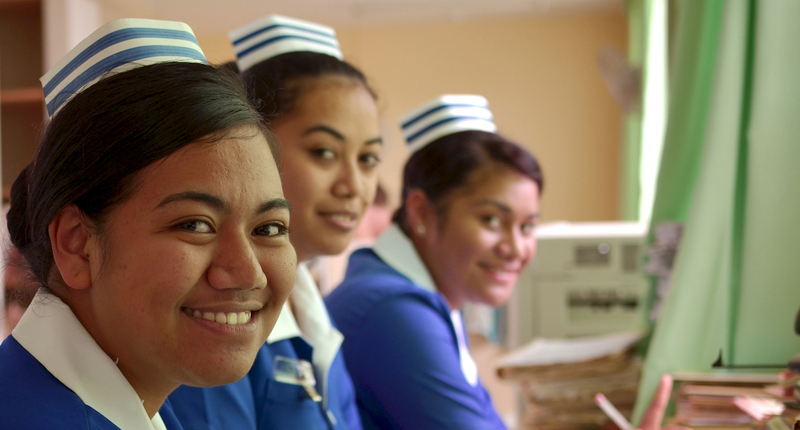 Brown, R and E Jimenez (2007), “Estimating the net effects of migration and remittances on poverty and inequality: Comparison of Fiji and Tonga”, UNU- WIDER Research Paper 2007/23. Gubert, F, T Lassourd and S Mesple-Somps (2010), “Do remittances affect poverty and inequality? Evidence from Mali”, Document de Travail DT/2010–08, Dauphine Universite Paris. Koczan, Z and F Loyola (2018), “How Do Migration and Remittances Affect Inequality? A Case Study of Mexico”, IMF Working Paper No. 18/136. Loritz, J (2008), “The incidence of remittances in Latin America and effects on poverty and inequality.” Maryland School of Public Policy. Margolis, D, L Miotti, E Mouhoub Mouhoud, J Oudinet (2013), “To have and have not: Migration, remittances, poverty and inequality in Algeria”, IZA Discussion Paper 7747. Möllers, J and W Meyer (2014), “The effects of migration on poverty and inequality in rural Kosovo”, IZA Journal of Labour & Development 3(16). Mughal, M and A Iqbal Anwar (2012), “Remittances, inequality and poverty in Pakistan: Macro and microeconomic evidence”, CATT Working Paper 2, Centre d’Analyse Théorique et de Traitement des données économiques, Cedex. Stark, O, J Edward Taylor and S Yitzhaki (1988), “Migration, remittances and inequality: A sensitivity analysis using the extended Gini Index”, Journal of Development Economics 28: 309–22.